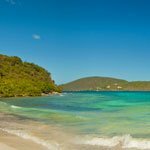 St John’s East End holds several wonderful beaches and secret snorkeling spots! You’ll also find fewer people on the East End because really the only way to get there is by renting a car or Jeep. That said, I highly recommend the adventure. Top destinations on the East End are Vie’s Beach / Hansen Bay, Haulover North, Haulover South and the mangroves of Hurricane Hole. 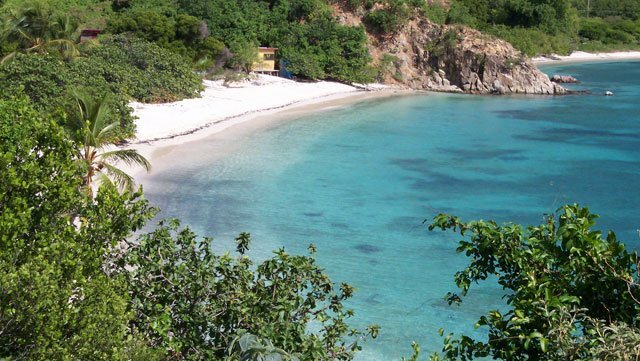 Located on the east end of St John is Hansen Bay. 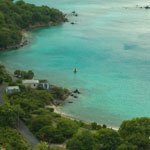 Although it is comprised of several beaches – the one most often visited is Vie’s beach – located directly across the road from Vie’s Snack Shack. She provides parking, a shady spot to enjoy some of her island cooking and access to the beach and beach chairs. NOTE: Closed Sundays + Mondays. Open 10am to 5pm. Closed Holidays. Just past Vie’s Snack Shack is another property that Vie Sewer manages, Hansen Bay Campground. 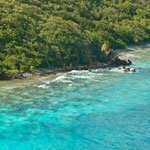 This rustic little corner of St john is perfect for the adventurous camper. Vie provides tents or bare spots …and each is located right on the beach! 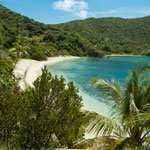 Once rarely visited, this beach is now quite popular with snorkelers. The beach is pebble with lots of flotsam and jetsam. Entry is easiest at the apex of the beach where the sandy bottom comes near the shoreline. Depending on wind and waves – this can be an easy snorkel or a bit of a challenge. The best times are early in the morning or when the wind is out of the south. 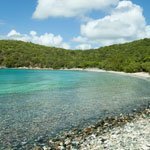 Located at the edge of the Virgin Islands National Park as you enter St john’s East End. Parking is catch-as-catch-can along the roadway or tucked into the trees just off the road. The beach is mostly cobblestone and coral pebbles. But there are some areas of white sand. With a south facing beach, Haulover South gets plenty of sun. And it’s a favorite among snorkelers. Snorkel is best along the eastern shoreline.